German Beer is known around the world for its rich taste. 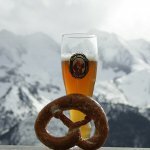 Every year Germans have an opportunity to celebrate the beer brewed in their country on German Beer Day, that is April 23. The holiday is celebrated since 1994. Beer was one the most popular drinks in Germany since at least the 9th century. This popularity brought to numerous attempts to find new and better flavors and increase the shelf life of beer. People started adding different components – herbs to make beer darker, chalk powder to make sour beer consumable again, even datura and fly agaric were reported to be added for special taste. On April 23, 1516 William IV Duke of Bavaria issued a historic order to brew German beer only of a few natural ingredients: water, hops and barley. At that time they didn't know about the yeast, but its spores are always in the air and they helped the fermentation. William IV's order is known to be one of the most important and oldest food-relating orders in the world and regulating brewing in Germany. Regarding this, Germans started celebrating of Germans Beer Day in 1994 to commemorate this important historic day.